• The Featherstone Tribute – a weekend of fun and fierce fighting is where David Brown recounts the recent event commemorating the man considered to be the father of modern wargaming, Donald Featherstone, in whose name a group of enthusiastic players, plus special guests, gathered at the Wargames Holiday Centre. • In A funny little civil war – wargaming the Sonderbund War of 1847, Arthur Harman has stumbled upon a central European conflict about which almost nobody knows anything – what a find! With a new book from Helion hitting the shelves right now, this exciting discovery could lead to some excellent games for the 19th century enthusiast. • Mick Sayce provides advice for the increasing number of wargamers moving into the micro-scales, where the prospect of creating the vast sweep of battle is enticing, but many are fearful of the challenge of tackling tiny castings with a paintbrush. Fear not – and read on in Painting tiny chaps – Mastering brushwork on 6mm miniatures. • Huzzah, huzzah for Texas! The Battle of Salado Creek 1842 comes from Chris Swan who describes a scenario recreating a significant encounter in the tortuous nineteenth century history of Mexican-Texian relations. It also happens to be a perfect size for a very manageable tabletop game! • And finally we have a trio of show reports from Hammerhead 2016 by Neil Shuck, Beachhead 2016 by Iain Dickie (yes, him!) and Cavalier 2016 by Mick Sayce (we like to keep ‘em busy!). • In his Briefing The Editor has been thinking about his health and the toll our hobby takes – and perhaps you should too. 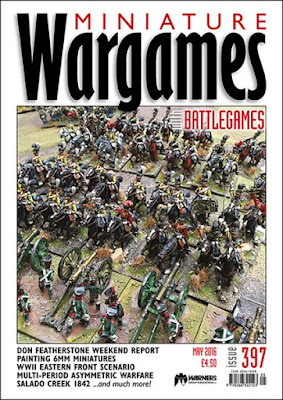 ; in his World Wide Wargaming, he continues his research into English Civil War gaming with an overview of some of the rulesets on offer, and of course has two more Blogs of the Month. • Neil Shuck ponders the subject of new editions of rulesets, examines some new products and does a bit of DIY terrain building, inspired by Diane Sutherland’s coffee stirrers last month. • Diane Sutherland herself, meanwhile, has always had a lot of bottle, and now she makes a brush with destiny – destined to become a tree, which makes her a jolly good feller, as she cuts her losses, smothers them in sticky stuff and tries not to see the wood for the trees. Or something. • In Fantasy Facts, John Treadaway enthuses about the biggest participation game show in the land, some TV-influenced miniatures, a ‘historo-fantasy’ range, funky sci-fi armour and buildings that look like... well... footballs! • Boardgame specialist Brad Harmer-Barnes is excited by the prospect of boardgame/ computer game crossover – and wonders why more hasn’t been done already. • It’s not just the Editor getting fit! In his Send three and fourpence column, Conrad Kinch creates a campaign aiming to be beneficial to the health of the players as well as being an enjoyable sequence of games. • Of course we have our Battlegames Combat Stress Appeal; our regular review slot Recce; and finally, our competition this month features the chance to win one of three copies of Helion’s fabulous new illustrated ECW ruleset with cardboard cutout soldiers: “BATTLE FOR BRITAIN – WARGAME THE ENGLISH CIVIL WARS 1642-1651” by Peter Dennis and Andy Callan. The front cover photo, taken by the Editor, is of Saxon heavy cavalry charging into the Russian reserve artillery during the refight of Leipzig held for the Donald Featherstone Tribute Weekend at the Wargames Holiday Centre. See Dave Brown’s report on page 32. Remember also to check out the new “Downloads” section on the new website.